Our family has cultivated traditional arable crops on the Kotaja’s farm for nearly 100 years. 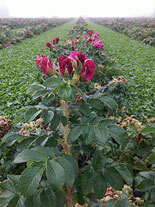 In the beginning of the 21th century, we started to develop rose cultivation. In the year 2007 we started a test plantation to research and develop the rose cultivation and studied different varieties of rose. We have also bred the rose and we continue to focus on plant propagation. In the year 2013 and 2014 we greatly increased the area used for rose cultivation. The development in our farm has led to many different foodstuffs, and the first to hit the market, in 2012, was our unique Finnish Plant Rose Petal Confiture. FP-Kotaja Oy is located in Vampula, Huittinen in south-western Finland. We are a family business, founded in 1983. We used to make world famous Finnish Percussion congas on our farm. They were our own design and used by the best drummers around the world. In the year 1993 we started the manufacturing of Vame-fitting machines and the development of various technologies mainly to construction industry.